Where to start? I’ll start many moons ago, in college, which was the last time I drank boxed wine. 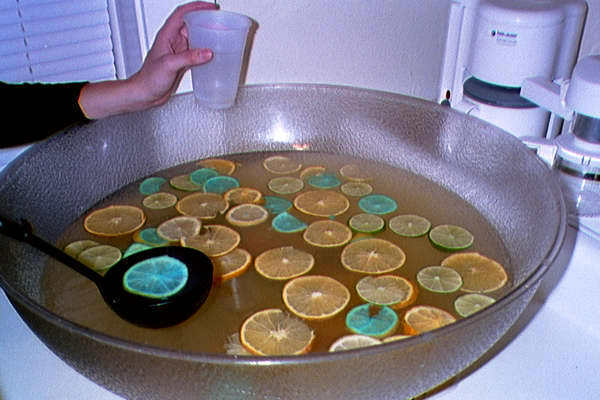 (And even then I only used the wine as a component of punch.) Cut to a few weeks ago at Thanksgiving, when my aunt — quite the oenophile — showed up at the family party with a Bota Box. We thought it was a gag until we tasted it: it was really good! The eco-friendly box houses the equivalent of four (count ’em, four) bottles of the award-winning wine — so when I saw it at my local Brooklyn liquor store I had to rub my eyes: was the price really $22? Wow. I’d bring it to a friend’s party, yes in part as a gag gift, but also as a great value for a tasty wine. The Bota Box website has more information on where it’s sold. 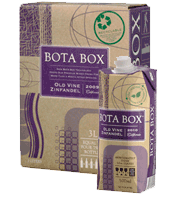 I’m fairly particular about wine, and I agree that Bota box is an excellent value. I’ve tried three – the pinot grigio (very good), the Malbec (good), and the zinfandel (stick with the Malbec). Good to know. I’ll try the pinot grigio next time I see it. My husband loves Malbec, and it is rare to find one in a box. Have you tried Target’s house brand of boxed Malbec? How does it compare? Boxed wines work well for us since we don’t like the same varietals. I just need to say that I am so jealous that you live in a world where you can buy wine at Target. For anyone who likes blends, I can recommend Big House Red. We used to buy the bottles as kind of our cheap house wine but the 3L box is much more economical – it means we can spend more on the non-boxed stuff! I’ll second the Big House Red and add that Big House White is our “house” white wine. What does the white compare to? I haven’t ever pulled the trigger on the white because I was unsure of what I might get. Bota makes fantastic boxed wine. we always have some in the fridge at home. Super excited to try this. I never wine at home because I’m the only one who drinks it and I feel bad wasting a whole bottle. Thanks for the great idea! ^insert “drink” — I never drink wine at home . . . although it looks like I’m drinking right now! I actually prefer the original – “wine” should be a verb. I’d love to wine right now. I plan on wining the instant I get home. Etc. The more I wine, the less I whine. Agreed. I want to go wine right now, please! I thought it was a new definition for the word wine. I rarely drink wine at home for the same reason (I usually end up having a glass or two and then cooking with it when it starts to get old). I think I might try the boxed wine solution as well! I’m confused. What is all this “leftover wine” of which people speak? Seriously… and… buy a hand pump thing like this: http://www.bedbathandbeyond.com/product.asp?SKU=14123148 then you can always have wine. Back when I was drinking (pregnant now) and husband traveled M-F for work, on bad days I would come home from work and nurse an entire bottle of red over the course of a few hours. No judgment here. I have something similar (bought at the wine store on my block) and it’s great. Really keeps wine fresh, no guilt, has paid for itself in wine not thrown away. I can easily put away a bottle of wine in a night–but got the frowny/judgy face from the doctor when I admitted it once. Okay, now I feel abnormal — I have a 2/3 full bottle of wine on my counter at home right now; I think I’ve had two glasses from it, and it’s been there a week! I almost always buy boxed wine, just because I am really finicky about the flavor of bottled wine after a few days open. I agree that the Bota Box brand is very good. H likes the Merlot. For anyone that prefers white, Silver Birch Sauvignon Blanc is my absolute favorite and I almost always have it on hand. Thanks for the rec . . . I adore sauvignon blanc! It reminds me a lot of Kim Crawford S.B., which is my favorite, but a little pricey to keep on hand all the time. I hope you can find it and enjoy it as much as I have! yum! I love all those Malborough SB’s . . . especially Kim Crawford! Will be on the lookout for Silver Birch! The Marlborough’s are my favorite, too. The Silver Birch is a Marlborough and I also like Cupcake SB – Marlborough, too, and pretty cheap! on the somewhat more affordable end ..
I’m always on the lookout for new ones to try, and would love any suggestions. I will have to look for the brands that you recommend. I don’t have any other suggestions beyond the Silver Birch box, Kim Crawford and Cupcake, all of which I like. I haven’t seen very many other NZ SBs in my neck of the woods, but our liquor stores leave something to be desired. I can’t wait to try a different brand, though! Yes! I love every one that you mentioned! I always forget about Dashwood as I only find it at World Market and local wine store Spec’s. You MUST try Mud House and MoMo. I always buy multiple bottles of both! Starborough and Cupcake SB are my grocery store go-to’s. Count me in as another addict — given thethe option, I will always choose Marlborough SB over any other wine (unless I’m actually eating steak at the time). My go-to supermarket label is Monkey Bay –it’s about $8/bottle if you’re buying any six wines at Safeway for the 10% discount. I like it even more than Cloudy Bay and Kim Crawford. I love the Bota Box! I almost always have one in the fridge. My husband mostly prefers beer and I don’t want to waste a partial bottle (or drink the whole thing on a school night! ), the box allows me to have one (or two) glasses. The Black Box wines are also quite good. My dad claims to prefer boxed wine, but he thinks Bota and Black Box are too expensive so he sticks with Almaden and the other cheaper brands. I got him a wine aerator for Christmas. I’m anticipating a holiday winetasting. Second the black box recommendation. 1- I got a boxed Spanish wine from a company called “Seven” the other day, and it was great. (The box is black and has colorful bulls on it.) Highly recommend. 2- I love boxed wine for cooking, because I can use just what I need without worrying about opening a bottle. I always keep a red and white boxed one on hand just for that, and they seem to last pretty much forever. 2- is a really good tip, thanks ! This may be our most on-topic discussion ever. Don’t worry, I’m here to change that. Has anyone ever used bloom.com (it’s an online makeup store)? Do you like it? I love boxed wine, especially the bota Malbec. The one at a time serving option is so wonderful. Have to share- I suggested boxed wine to my judge when I was clerking last year after he complained about having to open a whole bottle for dinner. He said that he and his wife tried that once but never again because he ended up drinking way too much as “it’s so easy to keep filling up.” So I guess it may have that effect also. I find that I drink more often, but less at a time, when I have some boxed wine in the fridge. the obvious question is, where can i buy this wine in NYC? oh sorry, i didn’t see that kat had linked to info about that. my bad. Perhaps not helpful now, but my favorite liquor store in NYC is Warehouse Wines and Liqour on Broadway between Waverly Place and Astor Place. It’s huge and the prices (at least on my favorite vodka) are good. I will ONLY drink Kosher wine (b/c it reminds me of when I was young). Lately, the manageing partner has been hinting at taking us all out for a party, but I do NOT want to drink, or to have him stareing at me when he drinks. He is MARRIED, and I told him to go home to his wife, not stare at me all day. So if we do go out, is there a place that offers Kosher wine? Threadjack: Is anyone willing to share their experience with a Keratin treatment (or a Brazilian blowout)? My hair has gotten increasingly dry and frizzy as I’ve gotten older, likely in part due to the fact that I have to color it to cover grays. As a result it’s increasingly unmanageable and virtually never looks polished, even when I spend the time to flatiron it (which I try not to do too often, since it’s really only making the dryness problem worse). My stylist raised the possibility of a Keratin treatment, and I’m intrigued but nervous about the cost and the time commitment (3+ hours and $300+ dollars every four-five months). Anyone else had it done? If it really will make my hair look great and healthy every day, I will definitely consider it. I had the Brazilian Blowout brand treatment done to my hair a few months ago. I bought Living Social coupon for my area and paid $130 for it, because at regular price it was just too steep for me. I chose Brazilian Blowout specifically because they claim that there is no formaldehyde produced with their brand of product (more on that below). Long story short, it was wonderful and it completely fixed my major frizz problems. So much so that I thought that I wouldn’t actually mind paying regular price. It made my hair much easier to style in the mornings and the frizz was pretty much completely gone. However, a couple months after I did it, I started reading more about it and apparently in random tests, it turns out that even the Brazilian Blowout brand produces very dangerous levels of formaldehyde on the scalp and in the air surrounding. California’s Department of something-or-other that works on safety has filed an official complaint against the Brazilian Blowout brand for lying about the presence of formaldehyde. I am not a scientist at all, but the quick research I did about formaldehyde as a carcinogen worried me to the point that I have decided never to do a treatment again, despite how wonderfully it actually worked and how nice my hair looked. I know someone who has done the keratin treatments regularly for about a year. Her hair looks amazing. Seriously, every day is a good hair day for her now. Your hair sounds very similar to hers. I’ve heard lots of talk about the toxic potential… but I can’t speak to it. I also bought a Groupon/Living Social/Buy With Me and did a Blowout. My hair is fine, slightly curly, and not very thick (I think that’s a nice way of saying it’s kinda thin). After I got it done, my ponytails looked great. However, I couldn’t wear my hair down because it always looked filthy–I think the problem is fine + thin + uber straight = looks dirty. Needless to say, I didn’t get another treatment. There are formaldehyde-free keratin treatments. I have done this treatment twice and was happy with results as my hair got softer. However, as I am of African decent, the new hair growth was visibly different and frizzier than the smooth treated hair. this meant I had to redo the treatment more often than the 5 month interval. I went in to talk to my hairdresser about a keratin treatment and she recommended that we start with a deep conditioning “glaze” (it was kind of like a non-color coloring. Anyway it was fabulous, my hair was so soft and shiny and it was WAY cheaper than a keratin treatment. So talk to your hairdresser about a middle ground! I have done the keratin/brazilian treatments and LOVE them! I have done them 4 times (last 2 at a discounted coupon price of $200) and have felt they are worth every penny. My hair is think, slightly wavy with a tendency to puff more than actual frizz and/or get odd curls if it gets wet or in humidity. With the treatments, it looks great all the time with no flat ironing. It is super soft and because it is thick , I haven’t noticed any issue with looking dirty too fast. in fact, I go 4 days or so before washing – because I can and because it makes the treatment last longer. In truth, I am somewhat concerned with the health aspects but am so in love with the results that I am still justifying it. That may change – I am going to try one of the 30 day at-home treatments and see how I like that as it has no formaldehyde – but I had to chime in that I have been so happy with the salon treatments! Thanks all! I’m aware of the formaldehyde concerns — my stylist claims to use the formaldehyde-free kind, but I will need to do more research. But the reviews on here are definitely tempting me! I’ve never had it done, but aren’t there concerns about its safety? Namely, the presence of formaldehyde? I would check that out before I get it done! Does anyone have a recommendation for a gentle shampoo for fine (but thick) hair? My hair type requires daily washing but my scalp is getting SO dried out in this weather. I try to skip a day between washes on the weekend and once during the middle of the week, but it feels and looks gross by mid-afternoon. I rock the pixie cut, so ponytails and whatnot are out of the question. I swear by California Baby shampoo. Yes, it’s for babies. But my hair has never been happier. How about a dry shampoo? I’ve been using Aveeno Nourish + Moisturizer shampoo and conditioner for a few months and I really like it. I have a lot of fine hair (so much that my colorist used to book my appointments for an extra 30-60 minutes when I was coloring it) but I only wash my hair about 2-3 times a week. You probably need to exfoliate your scalp once or twice a week. I use the Aveda men pure-formance exfoliating shampoo once or twice a week just like I’d use an exfoliant on my face. The formula itself is pretty gentle and has no sulfates. That may help you be able to skip washes more often as well. My hair type is exactly like yours, down to the pixie cut. I use a pea-size dollop of Garnier Fructise shampoo+conditioner. I find using too much shampoo dries out my scalp and too much conditioner makes my hair greasy. I think my hair is “bored” of the GF, so I’m switching to the Suave version when this bottle is empty. Fancy shampoos and conditioners only make my hair look good if I use a blow dryer. I also turned down my water heater so the water is just a tad warmer than lukewarm at the highest setting. That’s helped my dry skin a lot. But I do miss steaming hot showers. How about you moisturize your scalp by massaging a moisturizer or grapeseed oil or any other oil on it? Houda! Long time no see! Hope you are well :). Second the recommendation to massage oil on your hair before you shampoo. Olive or coconut both work wonders. Your hair is (after shampooing) clean, but not dried out. I use a dab of Fresh Soy shampoo every day, mostly because it is the most amazing thing I have ever smelled. The weird thing is, when my hair is wet the shampoo does not seem gentle (e.g., you would expect the hair to frizzy once it dries). But when my hair actually dries, it feels super soft and healthy. So I think the shampoo is relatively gentle. And, oh, the smell. Just wonderful. Skip the shampoo and wash your hair and scalp with conditioner. It will still be clean, I promise! Thanks for the recommendations, ladies! Looks like I have some good options to try. I didn’t see this mentioned so thought I would chime in even though you’ve already got some good options. I think a sulfate-free shampoo could also work really well as they are so much more gentle in my experience than those with sulfates. I recently started using one of the L’anza shampoos (the Healthing Smooth version, but they have different options for different hair types) and it is fantastic! Makes my hair super manageable and I can go a number of days between washes without it looking greasy. It is a bit on the spency side, but worth it in my opinion. Has anyone tried P90X? I’m looking for a varied exercise regime that is motivating to build overall fitness and strength. I’m not likely to be able to do the system recommended 6 times a week, but hope to do about 2-3 times a week; so I’m not expecting transformational results. Just looking for something that I’ll stick with for a while. How much floor space did you need? My living room is 13X14, with a couch, love seat, coffee table, wall unit, and exercise bike in it, and I still had room to do P90X by shoving the coffee table over. You need enough room to kick, lie down, and maybe move a few feet in either direction. Since each of the resistance workouts works a different body area, I don’t know how useful it will be if you’re alternating just a few of them a week, but the plyometric, yoga, and kenpo workouts would be great on their own too. I haven’t been able to stick with the routine consistently for more than three weeks at a time due to some major upheaval in my life over the past year, but even in three weeks I started noticing changes in my body and strength. I’m trying to get back into doing it consistently now. I didn’t do P90X, but did Insanity (which is similar but doesn’t require all the equipment). I. loved. it. I second everything JT said about the necessary space – my husband and I did it in our teeny living room. Another question about P90X…can you do it in your living room if you have downstairs neighbors? Worried about making too much noise…thanks! It probably depends on the construction, but I only felt comfortable doing certain parts (the Cardio video with all that jumping comes to mind) when I lived on the first floor. Then again, I’ve had loud upstairs neighbors in every apartment I’ve lived in so I’m probably overly sensitive to making noise myself, and maybe it wouldn’t have been that bad. I haven’t done P90X, but I will give a plug for Chalean Extreme, which is sort of like P90X lite – you only need a few dumbbells or resistance bands and a yoga mat-size space. You do the workouts 3x a week (with two other supplemental workouts during the week) and they last less then 45 minutes. I have only been doing it 3 weeks so far (full program is 90 days, then you can repeat) but I can tell a difference. And the time commitment is so much easier for me than the 90-minute workouts. So after reading this post at work, I (of course) stopped at my local grocery store on the way home and bought a box of the Merlot (no Malbec at the store I went to … I’ll keep looking). It is perfectly acceptable and only $16.99. It’s a keeper! Thanks for the suggestion, Kat! I bought the chardonnay box. I’m going to share it with my sister-in-law. My brother is in Paris on business and she’s at home with an 8-week-old. No malbec at my store either. I think I’ll go back and get the Merlot or the Cab Sauv. Has anyone tried the Yellow + Blue box wines. All of their organic and the Malbec is delicious. I’m interviewing for a customer service/admin position in the sales department of a newspaper on Thursday. Here in Saskatchewan people tend to dress down a lot- even at work- so I am unsure how I should dress for the interview. Does anyone here have advice either as an employee or employer as to what I ought to wear? I love boxed wine! We always have one in our fridge for cooking and drinking. I used to wine almost daily but I’ve cut way back as we’re no longer actively blocking babies. You can get some good quality wines in a box and I’ve converted a lot of people to boxed wine. Although for some that turn up their nose I call it wine in a cask, lol.